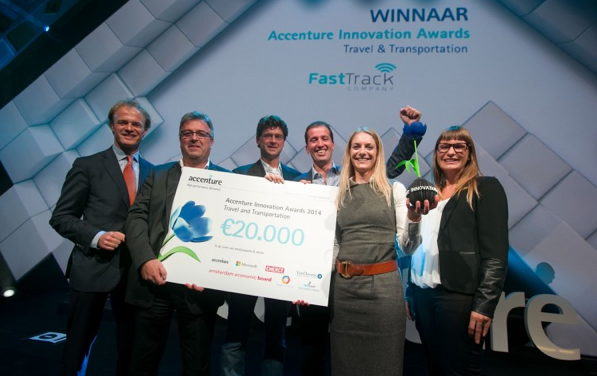 FastTrack Company’s eTag & eTrack win two Accenture Innovation Awards! We are thrilled with not one but TWO Accenture Innovation Awards! Thanks to excellent pitching by Kimberley, the juries of both the Communications and Travel&Transportation categories were convinced that eTag & eTrack are the most promising innovations of 2014. Needless to say that we couldn’t agree more. And that we are very happy with this important recognition from top executives at renowned companies like Heineken, Unilever, Google and of course Accenture. Versa is a Dutch company that has developed a unique tracking platform, with a patented automatic flight mode to comply with the most stringent aviation regulations. We are a B2B company solely focussed on helping our partners create great products for their customers, air travelers with check-in luggage.